Note: This is a review for the audio version of Water for Elephants. So I'll be incorporating my thoughts on the novel itself as well as the quality of the audio. That is the quote at the opening of Water for Elephants. And it couldn't be more fitting. The Benzini Brothers Most Spectacular Show on Earth may very well not have been what its name proclaimed it to be, but Water for Elephants has easily been one of the most spectacular novels I've read since I began reading regularly over two years ago. Water for Elephants is a pure pleasure from the prologue to the final chapter. Gruen's writing is fabulously descriptive without ever becoming sluggish or superfluous. She always gives you just enough so that you can imagine the scene of which she's depicting perfectly. So much so that it's as if there's a little cinema in your head, and playing on the screen is a vastly engrossing story with characters you can't help but fall for. Especially the lead. Jacob Jankowski is undeniably one of the most charming and compelling characters I've ever come across in any genre. He's so intrinsically innocent that I liked him almost instantaneously. I couldn't decided which version I liked more: the old Jacob or the young. And John Randolph Jones' narrative only adds to the appeal. His voice was absolutely perfect for the role as the ninety-something-year-old Jacob. David Ledoux does the voice of the younger Jacob, and I thought he did a wonderful job, also. He's one of those narrators that changes their voice when another character is talking so that it doesn't become confusing. And I like that. I really liked the side characters, also. The behind-the-scenes look at circuses and how they really operate was probably one of my favorite parts of this novel. You get to see how things really are; everything from redlighting (throwing circus workers off the train while it's moving in order to avoid paying their wages or for some other ridiculous reason) to animal abuse. You see that it's not all fun and games behind-the-scenes. "Sometimes I think that if I had to choose between an ear of corn or making love to a woman, I'd choose the corn. Not that I wouldn't love to have a final roll in the hay---I am a man yet, and some things never die---but the thought of those sweet kernels bursting between my teeth sure sets my mouth to watering. It's fantasy, I know that. Neither will happen. I just like to weigh the options, as though I were standing in front of Solomon: a final roll in the hay or an ear of corn. What a wonderful dilemma." "I close my eyes and reach for the far corners of my mind. They're no longer clearly defined. My brain is like a universe whose gases get thinner and thinner at the edges. But it doesn't dissolve into nothingness. I can sense something out there, just beyond my grasp, hovering, waiting---and God help me if I'm not skidding toward it again, mouth open wide." "I open the orangutan's door and set a pan of fruits, vegetables, and nuts on the floor. As I close it, her long arm reaches through the bars. She points at an orange in another pan. "That? You want that?" She continues to point, blinking at me with close-set eyes. Her features are concave, her face a wide platter fringed with red hair. She's the most outrageous and beautiful thing I've ever seen. "Here," I say, handing her the orange. "You can have it." She takes it and sets it on the floor. Then she reaches out again. After several seconds of serious misgivings, I hold out my hand. She wraps her long fingers around it, then lets go. She sits on her haunches and peels her orange. I stare in amazement. She was thanking me." "We lean against the wall in silence, still holding hands. After about an hour she falls asleep, sliding down until her head rests on my shoulder. I remain awake, every fiber of my body aware of her proximity." The ending of this has to be one of the best endings I've ever read. It was absolutely perfect for this story. 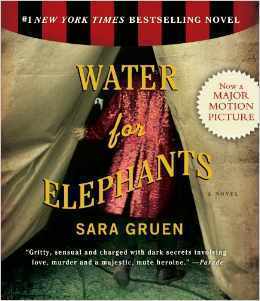 I enjoyed Water for Elephants so much that I'll be reading it again in print sometime before the end of 2011. Most likely this summer. Water for Elephants is a wonderfully entertaining and well-written story that I think everyone should read at least once. But if you're one who sometimes enjoys a good audiobook and you've already read this, please, try the audio version sometime. Sign into Goodreads to see if any of your friends have read Water for Elephants. Awesome review! I love this book and those quotes makes me want to read this again! Yeah, I've been finding some really good ones lately. older Jacob. Anyone disappointed with the book should try listening to the audio version. Outstanding!